Rev. Dennis J. Gallagher, OSA, PhD, is celebrating his fiftieth anniversary as an Augustinian priest. He was ordained in St. Thomas of Villanova Church, located on campus, Jan. 30, 1965, by Bishop Gerald V. McDevitt, DD, JCD, VG. Born in Bryn Mawr, Father Gallagher was raised in Rosemont, Pa., where he attended St. Thomas of Villanova elementary school and attended West Catholic High School in Philadelphia. In 1955, he entered the Good Counsel Novitiate, New Hamburg, New York, to begin his studies for the priesthood. He earned a Bachelor of Arts (BA) degree in Philosophy from Villanova University in 1960 and also received a Master of Science degree in Library Science (MSLS) from Villanova University in 1965. He earned his Master of Arts in Religious Studies from Augustinian College, Washington, D.C., in 1965. In 1975 Father Gallagher received his PhD in Administration (Higher Education) from The Catholic University of America, Washington, D.C., and he has completed additional studies at Northeastern University, Boston, Mass. Father Gallagher was assigned to Austin Preparatory School, Reading, Mass., from 1965 through 1969, where he was teacher, librarian and director of Reading Services. He was then assigned to Malvern Preparatory School, Malvern, Pa., where he served as a teacher, librarian and also served as residence hall minister in Tolentine Hall until 1972. In 1975 he became a professor in Villanova’s Graduate School of Library Science and also served as a residence hall minister in Stanford Hall and in McGuire Hall from 1975 through 1997. Father Gallagher is the first full-time University Archivist. At the time of his appointment in 1985, he was quite familiar with the University, its history and personnel. University President, The Rev. John M. Driscoll, OSA, PhD, decided that it was important to have a full-time university archivist, someone who could help prepare materials for the upcoming University Sesquicentennial, and Father Gallagher was the logical choice. (Villanova Magazine, Vol II, No. 1, October, 1995, p.13.) Father Gallagher designed a historical exhibit for Villanova’s sesquicentennial. 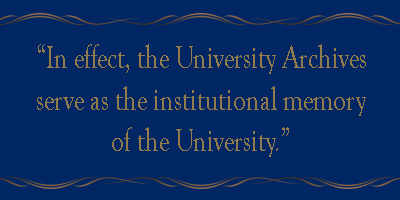 In 1989, Father Gallagher developed the “Handbook for the Collection and Preservation of University Records.” In 2012 Father Gallagher collaborated with University Legal Counsel in the development of the policy and guide, namely “Villanova University: Retention and Management of University Records,” approved by the University President, Rev. Peter M. Donohue, OSA, PhD, and the President’s Cabinet in 2013. This is a comprehensive policy and guide with information for all offices and departments, including what University records should be transferred to the University Archives and those records that are no longer useful. For more information about the University Archives see http://www.villanova.edu/library/archives/. Father Gallagher says, “In effect, the University Archives serve as the institutional memory of the University.” And in the 1995 Villanova Magazine article he said “obtaining material is an uphill battle.” Even with the existence of this University policy Father Gallagher hopes that more records will be transferred to the University Archives. When asked what is the oldest object in the University Archives, he says it is “the 1793 survey of the property that later became known as Belle Air.” This document is framed and hangs on the wall in the research and exhibit area of the University Archives. Mark Thompson of Mark B. Thompson Associates LLC, Philadelphia, acquired the document from the original family. Thompson donated the survey document to Father Peter M. Donohue, OSA, PhD, University President, who presented it to the University Archives. An interesting artifact, currently on exhibit in the University Archives, the original lock and key from Belle Air, the Rudolph mansion which stood where St. Rita’s is now. Belle Air was where Villanova’s first students and Augustinians lived and studied. The lock and key are all that remain of the mansion which was destroyed in a 1912 fire. Some of the earliest student “jug books” listing student infractions from the 1850s are also housed in the University Archives. Records, artifacts, photographs, negatives, slides, various memorabilia and much more are all housed in the University Archives, which are now located on the ground floor of Falvey in a suite between University Communications Creative Services and Viewing Room 3. The University Archives moved from the fourth floor to the newly renovated ground floor space during the summer. In addition to his full time position as University Archivist, Father Gallagher created the sesquicentennial exhibit in 1992 and co-authored with David R Contosta the exhibition catalog, Villanova: College to University: 150 Years of Augustinian Tradition and Promise, 1842 – 1992. He is also co-author of Ever Ancient, Ever New: Villanova University, 1842 – 1992, a pictorial history of Villanova University. 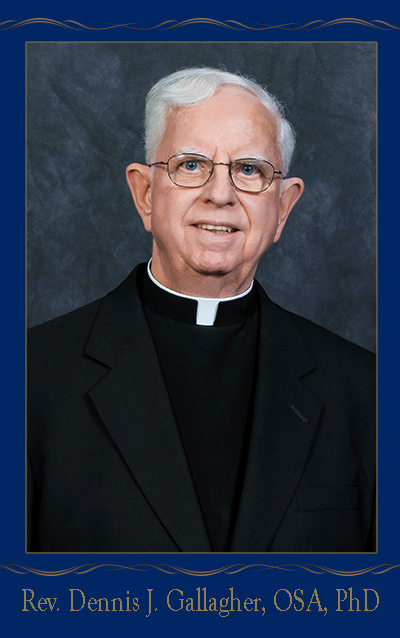 Father Gallagher was the research and editorial assistant for Villanova University: American–Catholic–Augustinian. Since 1989 Father Gallagher has been the weekend assistant at St. Catherine-St. Margaret Parish in Spring Lake, N.J. He is the spiritual director of the Third Order of Mount Carmel in Spring Lake. Earlier he assisted in other parishes in the Diocese of Trenton, such as Incarnation, Ewing, and St. Alphonsus, Hopewell and from 1975 to 1986 he assisted at the Sisters of the Holy Child Jesus in Rosemont. Father Gallagher is a member of the Knights of Columbus (3rd degree). For his service to community, in 1984 he was inducted into the Chapel of the Four Chaplains Legion of Honor. Father Gallagher, despite his schedule as the University Archivist and parish ministry at St. Catharine-St. Margaret Parish in Spring Lake, N.J. on the weekend is also a world traveler. In Italy he has visited Rome (of course), Assisi, Florence, Milan, Pavia, and Venice. He has also visited Ireland, home of his ancestors, many times. He has visited Bermuda, Croatia, Czechoslovakia, Egypt, England, Greece, Istanbul, Turkey, North Africa, Russia and Spain. He has followed in the footsteps of St. Paul the Apostle. He also visited Alaska, Hawaii and the Canadian Rockies. He is a member of the Delaware Valley Archivists (DVAG), the Mid-Atlantic Regional Conference (MARAC), the Society of American Archivists (SAA) and the Tri-State College Library Cooperative (TCLC) – Archives and Special Collections Interest Group. 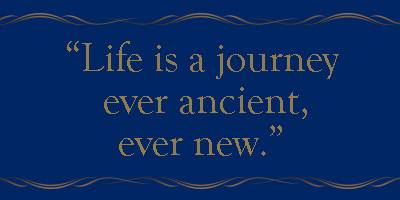 Father Gallagher often says, “Life is a journey – ever ancient, ever new.” And he intends to continue this journey for many more years. He has no plans to retire; he would enjoy celebrating the University’s next major anniversary, its 175th. Congratulations to Fr. Gallagher on his 50th Anniversary of Ordination. Many years of service to Villanova are included in those 50 years. May the Lord grant him good health and perseverance. I enjoyed the article. Even though I have known Father for many years, I learned more about his accomplishments. Congratulations Father Gallagher I wish I could have attended your ceremony and wish you all the best. Congratulations , hope that you have many more success stories. Hoping to meet you again. Dear Father congratulations, I still can remember you coming down to visit with my Grandmother Grace Reimel on Franklin St. sitting on the front porch with her. I am pleased to read about your accomplishments it life.